Also known as Music City, Nashville established its humble beginnings in the late 1700s when the early settlers disembarked on the shores of the Cumberland River amidst fiddle tunes and buck dancing. Shortly after the production of Western Harmony, which was a book of hymns and instructions for singing, Nashville gradually became recognized as the city for music publishing. Throughout the years, the city has welcomed songwriters from around the world to learn the art and express their passion for music. Along with country music, Nashville is also home to genres like bluegrass, classical, blues, contemporary Christian, Americana, and jazz. Many popular artists such as Kid Rock, Michael Buble, Bon Jovi, and Black Eyed Peas have visited Nashville to write and record. With over 130 music venues throughout the town, visitors and locals alike can enjoy live music 365 days a year. Old Town Trolley Tours of Nashville is the best sightseeing tour provider in the city. We offer unlimited hop on and hop off ability, frequent pickups, and a large trolley fleet that’s perfect for families, couples and special occasions, like a wedding! Travelers have continually trusted us to offer them an unprecedented view of Nashville’s top attractions and our 2-day itinerary will help you have the best vacation in Music City. The first stop on the tour is Fido in Hillsboro Village, near trolley stops 10 and 12. Conveniently located near Vanderbilt University and Belmont University, this popular restaurant boasts food made with organic and locally sourced ingredients. Some tasty dishes at Fido include scrambled eggs with jack cheese, spinach, salsa, or feta as well as bagel sandwiches with cream cheese, capers, salmon, or hummus. And don’t forget a cup of coffee or espresso beverage to complement the breakfast entrée. You’ll need the pep in your step for a full day of sightseeing. Hop off the trolley at stop 1 and start shopping on lower Broadway Street. Some of the shops on this famous street include Opry Originals, Barbershop Harmony Society, Rocket Fizz Soda Pop and Candy Shop, Simply the Best $10 Boutique, Music City Marketplace, Boot Country, and Music City Shop. Nashville is known for offering some of the greatest stores, so you shouldn’t have any problems shopping for stylish clothes or music records. Not ready to get off the trolley yet? You can also enjoy the view of the stores while window shopping Broadway Street aboard the trolley. Next up is the Country Music Hall of Fame, located near trolley stop 2. Featuring over 350,000 square feet of state-of- the-art galleries, retail stores, education classrooms, archival storage, and special event space, you will be immersed in the history and sounds of country music as you walk around this famed attraction. After spending a few hours visiting the exhibits at this top attraction, you’ll have a better understanding of the beauty and cultural importance of country music. Don’t forget to visit the gift shop where you’ll discover an extensive collection of CDs and unique souvenirs. 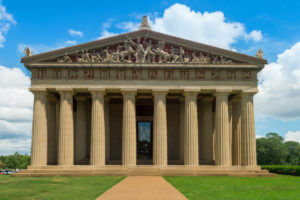 The Parthenon is mostly known as Nashville’s art museum. Throughout the attraction located at trolley stop 9, you can view a permanent collection of 63 paintings by 19th and 20th century American artists like Katherine Ace. Since the Parthenon is home to a variety of shows and exhibits, the attraction will interest pretty much everyone. End your day at stop 11 with dinner at Urban Cookhouse, a counter-serve restaurant offering sandwiches, salads & entrees with a focus on local produce. Hop off the trolley at stop 10 to start the day off right by enjoying a home-cooked meal. For the past thirty years, The ROW has been the hangout for famous singers and songwriters. Today, the restaurant is home to tourists and locals alike who enjoy delectable food, rustic ambiance, free parking, and outdoor dining. With a full breakfast menu, you can choose a tasty dish like BBQ Hash Skillet, Fried Chicken and Biscuits, Steel Cut Oatmeal, French Toast, or Steak and Eggs. You will definitely experience the true taste of Nashville at The ROW. Step off the trolley at stop 2 and tour the Music City Walk of Fame. Open twenty-four hours a day in the heart of downtown Nashville, this landmark is a tribute to artists from all genres of music who have made significant contributions to the music industry. Some of the most recent inductions from the past ten years include CeCe Winans, Mike Curb, Frances Preston, Dolly Parton, Bobby Hebb, and Peter Frampton. The landmark boasts a total of 61 impressive inductees. After an entire day of sightseeing, you’ll be ready for a hearty lunch. Think all southern food is heavy and unhealthy? Think again! Located in downtown Nashville near trolley stop 2, The Farm House presents southern-styled entrees that are made from fresh and locally sourced ingredients. Since 2013, the menu has featured comfort cuisines made with homemade vinegars, smoked meats, and house-preserved produce. After eating a yummy breakfast, tour the Tennessee State Museum, located near trolley stop 4. This top attraction tells the story of the state’s rich history including the Civil War, the age of Jackson, antebellum south, reconstruction era, and the prehistoric frontier. Expanding approximately 120,000 square feet, the museum currently occupies three floors with about 60,000 square feet devoted to exhibits. The exhibitions and programs at the Tennessee State Museum are designed for your educational and cultural enrichment. In the mood to sample Nashville’s nightlife and best restaurants? The Night Crawl in Germantown gives you the opportunity to sample some of the city’s most popular restaurants including 5th and Taylor, Rolf and Daughters, Barista Parlor, and Cochon Butcher. Throughout this event, you will also experience one-on- one time with the chefs while sipping handcrafted cocktails. You can also enjoy food and beverages like specialty sandwiches, coffee, pasta, sausages, and vegetables. One of the most popular times to visit Nashville is during the summer months, which coincides with the city’s warmest temperatures. The hottest month of the year in Nashville is July, when the average temperature is about 90 degrees Fahrenheit. You’ll want to pack the necessary items to combat the heat and make your sightseeing adventure more enjoyable.